Short CV: Aggelos Bletsas received with excellence his five-year Diploma degree in Electrical and Computer Engineering from Aristotle University of Thessaloniki, Greece in 1998, and the S.M. and Ph.D. degrees from Massachusetts Institute of Technology Media Laboratory in 2001 and 2005, respectively. He has worked at Mitsubishi Electric Research Laboratories (MERL), first as summer intern and later as Postdoctoral Fellow and he has collaborated with Radio Communications Laboratory (RCL), Department of Physics, Aristotle University of Thessaloniki, as a visiting scientist. 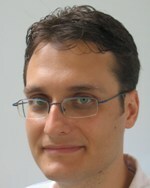 Since summer of 2009, he has been with the Department of Electrical and Computer Engineering, Technical University of Crete, Chania, Greece and affiliated researcher with Telecommunication Systems Institute (TSI). His research interests span the broad area of scalable wireless communication and networking, with emphasis on relay techniques, ultra-low cost backscatter sensor networks, signal processing for communication, radio hardware/software implementations for low cost embedded networks, RFID, time/frequency metrology and bibliometrics. He received best undergraduate thesis award in 1999 from Ericsson for the development of a complete text-to-speech system for the Greek language, and he was a recipient of a BT Fellowship Award and a Nortel Networks Fellowship Award from 2000 to 2005. Dr. Bletsas was the co-recipient of IEEE Communications Society 2008 Marconi Prize Paper Award in Wireless Communications, best paper distinction in IEEE International Symposium on Wireless Communication Systems (ISWCS), September 2009, Siena, Italy, best student paper award in IEEE International Conference on RFID Technology & Applications (RFID-TA), September 2011, Sitges, Spain, best paper distinction in IEEE Sensors Conference (SENSORS), November 2013, Baltimore, USA, best student paper award-SPCOM track and conference-wide best student paper award, IEEE International Conference on Acoustics, Speech and Signal Processing (ICASSP), April 2015, Brisbane, Australia, best student paper award in IEEE International Conference on RFID Technology and Applications (RFID-TA), September 2017, Warsaw, Poland and best student paper award in IEEE International Conference on Modern Circuits and System Technologies for Electronics and Communications (MOCAST), May 2018, Thessaloniki, Greece. He is also proud of his students who were winners for two consecutive years of the 2009-2011 and 2011-2012 best Diploma Thesis contest among all Greek Universities on "Advanced Wireless Systems", awarded by IEEE VTS/AES joint Greek Chapter. He has received several grants, financing his graduate students. He has been evaluated positively by the European Research Council (ERC) 3rd Starting Grant Call call (2009-2010). In December 2013, he was the recipient of the 2012-2013 Technical Univ. of Crete Research Excellence Award. Courses: Analysis & Design of Telecom Modules (undergraduate, winter), Detection & Estimation (graduate, fall), Introduction to Probabilistic Graphical Models & Inference Algorithms (graduate, winter).